I liked this one folks and it's not often that a movie to game transition is easily made. 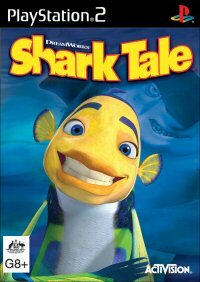 Don't get me wrong, Shark Tale doesn't redefine any genre at all, it's just good old fashioned fun that fans of the movie will get a kick out of. There's really something for everyone here regardless of what style of gameplay that you are into. There are a number of different things that must be done including Racing, Adventuring, Fighting and even Dancing! So if there isn't something there that appeals then I guess it's simply bad luck. I'll get this out of the way quickly for you, if you have a dance mat for the PS2, grab it out when you play this game as you can use it during the dancing sequences making for a lot of animated fun both on and off the screen. I thought it was worth mentioning as dance mats are not that expensive anymore either so worth the purchase. If you haven't seen the movie then I better sum it up quickly for you or risk alienating you for the rest of the review. 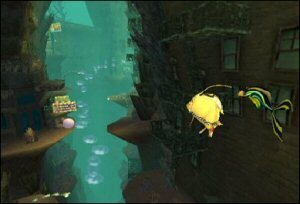 You get to play the role of the hero Oscar who is a small fish that owes quite a bit of money to the local loan shark (literally) Don Lino. When Oscar doesn't pay the debt, Lino sends his son Lenny to take care of this no good fish but it turns out that Lenny is a vegetarian! The shark and fish work out a scam to try to get Oscar the money that he owes and some more in the process, however the whole thing backfires and that's where all the fun comes into the game. I think one of the things that make this game so much fun and generally enjoyable is that even though there has been a real effort to be true to the film, the change in game styles through the title will mean that gamers should never get sick of playing the game at any stage, there really isn't any reason to be as by the time you are sick of anything, it'll be over and you'll have a list of new things to move onto. Fans of the flick and gamers alike should be really pleased with the appearance of the title, they've done a really neat job of making all the characters represent their movie counterparts, and the depth of detail in the gaming environment is something to behold, it's all executed very well and is pleasing on the eye. 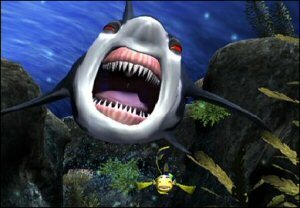 Audio is well done in terms of general in game sounds and music score, however it was really surprising to find that they couldn't use the voice of Will Smith who plays Oscar in the Shark Tale movie. The guy who is used sounds pretty heavy handed and you do lose the sense of realism that you would have gotten in the game if it has been otherwise. There isn't much in the way of a learning curve here to test players out either in any of the stages. There is a series of helpful arrows and hints and tips that appear on screen just when you need them and that sure does allow you to just get in and have fun. I think that this is a nice way to look at games of this nature as the first thing that gamers want with this type of title is the ability to get in and relive the moments of the film that made you enjoy it as much as you did. 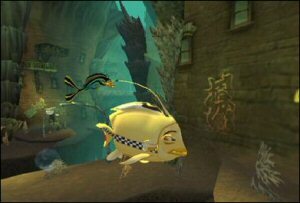 Shark Tale is a rare beast in that it does almost exactly what it's meant to: bring a movie home in an interactive and fun form that gamers can lose themselves in as a good little distraction as you play your way through an entertaining experience. Recommended.